Ayia Napa is Hot! Very Hot! All day… All night… All holiday! June, July and August in particular can get very sticky – Without wanting to sound like parents, stock up on your high factor tanning lotion! Over the years we’ve seen hundreds of people fry on the first day and have there holiday ruined. Sun stroke is the leading claim for youngsters on the health insurance… So apart from looking like a lobster you will have to have a hydration injection in your arse. Bring light fabric clothes… Jeans, long dresses, blazers are a massive no-go! 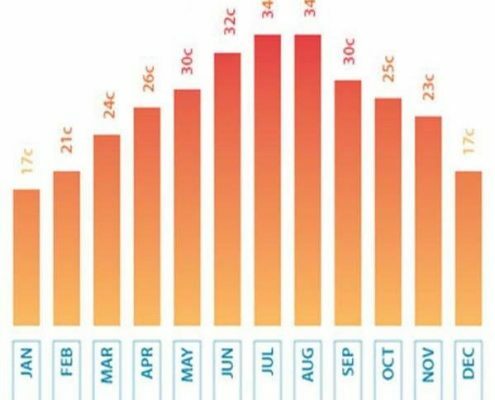 Your hotel is going to be the most expensive outlay of your holiday… But it’s worth spending that extra bit of cash to make sure you have Air con in your room… When the temps hit 36 degrees you’ll need that bad boy – trust us.